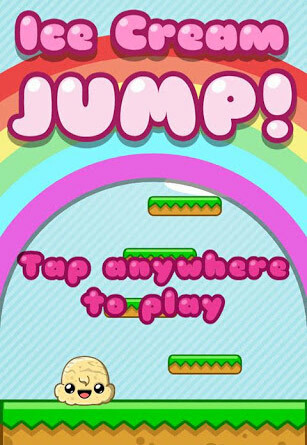 This is Ice Cream Jump! It's a free app from Retro Dreamer. It's a very simple game at the moment, but they are working on it and adding features as we speak. (The iTunes version got the update first, the android version is updated now). Basically you tilt the phone side to side as the ice cream keeps bouncing and you have to go as high as you can. Let me just say that an apple a day keeps the bees away! This isn't going to keep your interest for an hour or two, but if you've got a few minutes to burn, this is perfect. Basically you tilt the phone back and forth to slide the ice cream down lower and lower. You collect coins and letters and oh yeah, watch out for the bees again! Just like Jump, this is only meant to burn a few quick minutes before you move on. This one is definitely my favorite of the two because it's more developed. 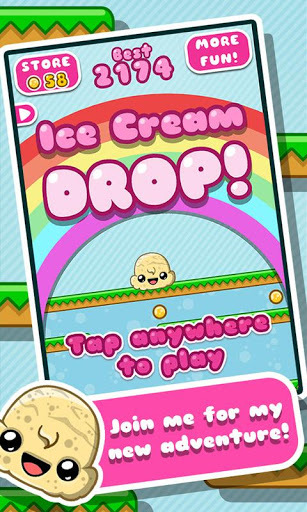 The coins you have collected can be used to enhance your ice cream in a way that almost reminds me of Temple Run. So both games are cute and both are free (supported by tiny ads at the bottom and the occasional invasive ad). I do like these games despite their simplicity. I look forward to seeing what new features they add. Hopefully Jump! with catch up with Drop! in terms of options. *security note: most of the retro games are minimally invasive, though the new ice cream drop does ask for the option to scan for running programs. *disclaimer: this is not a paid advertisement, it's just dumb luck that I ran into these games.